Welcome to the beginning of one of the great adventures of your life: being a student at one of the world’s most prestigious research universities, UCI. Congratulations! You should be tremendously proud of your accomplishments, and we are thrilled that you are here. It’s an added bonus that you are at a university that has the most feared, revered and respected of all the college and university mascots in America, Peter the Anteater! Zot! Zot! Zot! You arrive at a historic moment in the life of this great university. Fifty years ago, on Sept. 26, 1965, when this region consisted mostly of rolling hills and this university existed mostly as the as-yet-unrealized dream of an amazing founding faculty and staff, UCI held its very first student convocation. Those students, working with our founding faculty and staff, did set standards of excellence, and we are the beneficiaries of their aspirations and accomplishments. You are now part of that history. This year, as we celebrate our remarkable first 50 years, I hope you will take the time to learn more about our history. 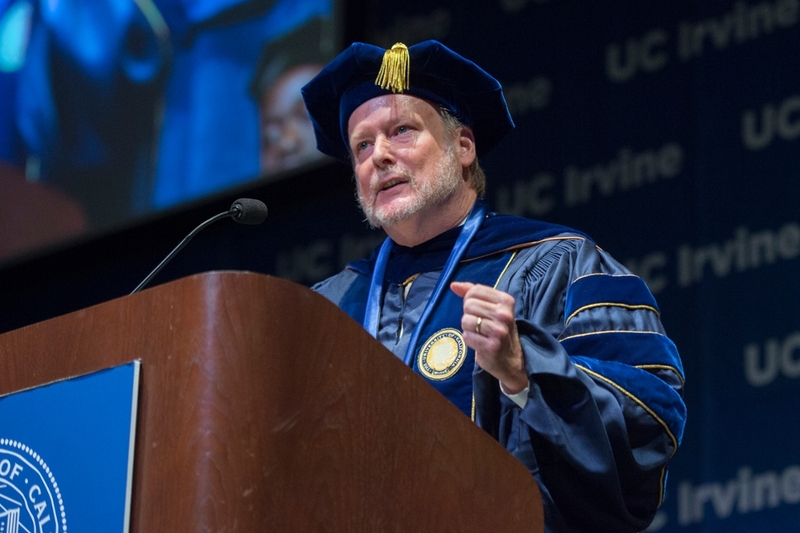 Learning more about the story of UCI will inspire you, deepen your pride in being here, and perhaps raise your sense of what you can do if you put your mind to it. And, of course, you are also now part of our future, and we are all here to ensure that you have a world-class educational experience, because your success is our success. We will walk beside you in the years to come as you work toward your degree, and we will continue to be there for you after you have earned your degree, when at commencement – which will be here sooner than you think – you set off to make your mark upon the world. The years to come will be exciting, unforgettable in the best possible way. It’s going to be great – great but not easy, not without its challenges. If it were easy, anybody could do it, and we wouldn’t have to spend the time to admit the very best students. You’re all very smart, but being smart and accomplished will not be the key to your success here. More importantly, you’re going to have to work hard, be tough and demonstrate persistence when you face obstacles. But don’t worry; you’re here because we have faith in you. And you’re not in it alone; all around you are helping hands. You have heard many things about what precisely you are supposed to be doing on this journey. And I want to say a few things about the point of it all, in the hope that it will shape the choices you make as you consider how to take full advantage of this extraordinary opportunity. This institution was created 50 years ago to do the serious and important work of providing fundamental research that would serve the people and of providing you with an education worthy of your talent and your promise – an education that will lead you to live a more satisfying and meaningful life; be a knowledgeable, thoughtful and discerning contributor to your community; and be a force for good in the world. This is a grand and noble thing, and I mention it because sometimes people talk about higher education as if our mission is a small and narrowly practical thing, as if the point is merely to provide you with a credential and some useful skills, as if we do this for employers rather than for your overall well-being and for the benefit of society more generally. If credentials and useful skills were all we had to offer, there would have been no reason to construct this expansive and extraordinary campus for you, with amazing learning spaces, great labs, studios, libraries and beautiful grounds. If our job were merely to do a small and narrowly practical thing, there would have been no reason to recruit for you a faculty comprising women and men who are the very best in the world in their fields, scholars and creators and professionals who are making fundamental contributions to new knowledge, creative expression, and clinical and professional practice. That’s the important point I want to convey to you as you begin this journey. We exist because we believe that nurturing a rigorous and broad intellectual culture – focusing on knowledge creation arising out of the values and practices of a scholarly community – is of deep benefit to free human beings and to the world. Gutting says that exposure to intellectual culture makes human beings “aware of new possibilities for intellectual and aesthetic fulfillment,” including “the beauty of mathematical discovery, the thrill of scientific understanding, the fascination of historical narrative, the mystery of theological speculation,” and that the success of this enterprise should be measured “by the enduring excitement it generates” in you as someone whose life is enriched by ongoing exposure to new knowledge, creativity and the fruits of exploration. But aside from the lasting personal fulfillment you will experience as a result of this journey, I would add a few other articles of faith that animate this genuinely utopian enterprise. First, those of us who do this work believe that human beings only reach their full potential when they are broadly educated; when they are exposed to the best that has ever been thought, created or discovered; when they become discerning about competing claims. Also, we believe education is the essential precondition of freedom and democracy. I say “freedom” because one major point of higher education is to empower you to think for yourself. If you never develop that capacity, you are at the mercy of those in politics, business and culture whose job is to bend your mind in the direction of their interests. Democracy also assumes that the people know enough about government, public policy, economics, history, human values, culture and the natural order of things to evaluate the behavior of their representatives and steer the community in the direction of the general welfare. Also, becoming an educated person allows you to interact with broader and more diverse groups of people, which is essential to the advancement of humanistic values and a necessary condition of existing happily and productively within our increasingly heterogeneous society. Immersion in a world-class intellectual culture also leads you to develop valuable habits of mind that last a lifetime: a deepened capacity for reflective thought, an appreciation for the persistent questions of human existence, the ability to communicate your ideas with clarity and power. There is more to say about the value of having talented young people immersed in a genuine world-class intellectual culture, but you get the point: The significance of this journey, for you and for the world, is much larger than is suggested by many commentators about the purpose of higher education. Education at the highest level is your liberation and society’s salvation. I should warn you, though: If you do this right, you will be made uncomfortable. Some of your cherished views may be challenged. The point of a great university is not to keep you in a bubble of familiar views. Deepening your commitment to a preexisting faith is what seminaries and other institutions of religious, ideological or political instruction are for, not what universities are for. We are in the business of challenging inherited wisdom, breaking through the crust of convention, testing what we think is true, and then testing again. If an idea can’t be defended with arguments and evidence, as evaluated by the standards of a world-class faculty, it may not be a conviction that deserves your loyalty. The better the faculty, the better the test, and you are here because of the quality of our faculty. And so allow yourself to be tested by the standards of reason and rational argumentation, and allow yourself to be inspired by a spirit of exploration. If you think of yourself as inclined toward math and science, then make it a point to take courses in the humanities and arts. If you have a passion for dance, literature or art history, be sure to get some real exposure to the scientific method and contemporary understanding of the workings of the natural world. In particular, take advantage of our Illuminations programs, which are designed to expose you in a serious way to art and creative expression, no matter what corner of the campus you consider home. There is not a field of study where such exposure won’t deepen your view of the matter and trigger important new ways of thinking and being. I end these remarks – as I end most of my campus communications – by invoking the official motto of the University of California. Does anyone know the official motto? I think it is a wonderful motto for one of the world’s great institutions of higher education. I hope it will inspire you. Pursue that which is illuminating. Be a vessel through which enlightenment eradicates the darkness – the darkness of ignorance, of intolerance. Learn about our bright past, and help usher us into our more brilliant future. Again, welcome to one of the great adventures of your life. A vast landscape of inquiry and discovery lies before you. We are all looking forward to walking this path with you.